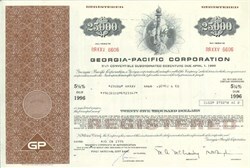 Pack of 100 Certificates - Georgia-Pacific Corporation - Statue of Liberty Vignette - Price includes shipping costs to U.S.
Home > Certificate Quantities for Educators / Business Promotions > Pack of 100 Certificates - Georgia-Pacific Corporation - Statue of Liberty Vignette - Price includes shipping costs to U.S. Beautifully engraved certificate from the Georgia-Pacific Corporation This cancelled document has an ornate side block border with a vignette of the statue of liberty celebrating the Country's bicentennial. This item has the printed signatures of the Company’s President and Secretary.